The #MeAt14 Twitter campaign aims to “show what a 14-year-old looks like” in response to allegations that Republican Senate candidate Roy Moore made sexual advances toward teenagers. Celebrities like Sarah Silverman have participated in the online campaign, in which women have been sharing pictures of their 14-year-old selves. Several high-profile Republican senators have said they believe Moore should step aside. Following accusations that Republican Senate candidate Roy Moore of Alabama made sexual advances toward a 14-year-old girl when he was 32 in 1979, women began tweeting pictures of themselves when they were 14. Many of the photos, which several female celebrities have shared, also include accounts of what they were doing at the time instead of dating men twice their age. 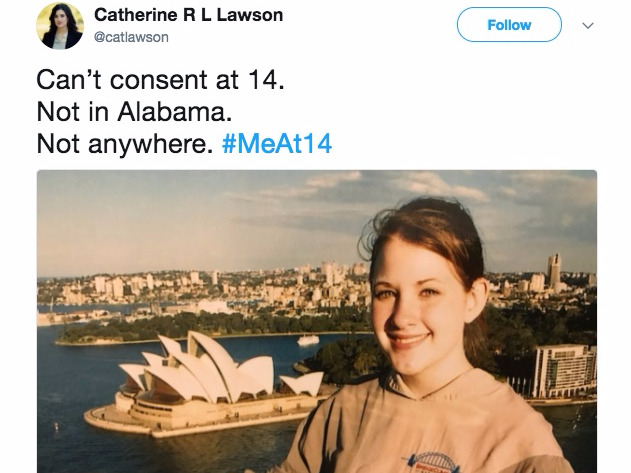 Lawyer Catherine Lawson started the #MeAt14 campaign. She said it aims to circulate images of girls who were the same age Leigh Corfman was when Moore allegedly pursued her. “Show what a 14-year-old looks like. Affirm they’re not capable of consent. Remind people *kids* deserve protection,” Lawson tweeted. Following the Washington Post’s publication of the allegations last week, Moore has denied its claims, and threatened to sue the paper for the article. Several prominent Republican senators, including Sen. Mitch McConnell, Sen. Roy Gardener, Sen. Susan Collins, and Sen. John Cornyn have all said they think Moore should step down from the Alabama race. #MeAt14 Here’s a diary entry about the time I started crying at a dance because I was scared of dancing with boys.